The Customer Service Call Center Representative manages large amounts of incoming and outgoing calls on behalf of the company, as they are the first point of contact with the company, these representatives take up chief responsibilities like – taking orders, registering customer complaints, following communication script, identifying customer needs, clarifying service queries, researching every issue, explaining details of products, services and gathering details to inform to the related department. 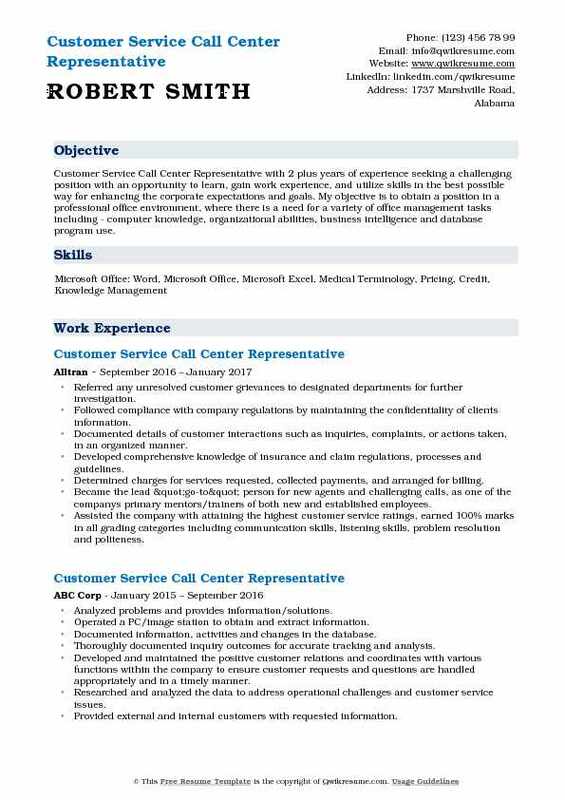 The most highlighting Customer Service Call Center Representative resume sample showcases excellent listening skill, problem-solving ability, Customer servicing attitude and sound interactive skill. When it comes to educational qualification, the best resume depicts a High School degree or a Bachelors degree along with some call center training. 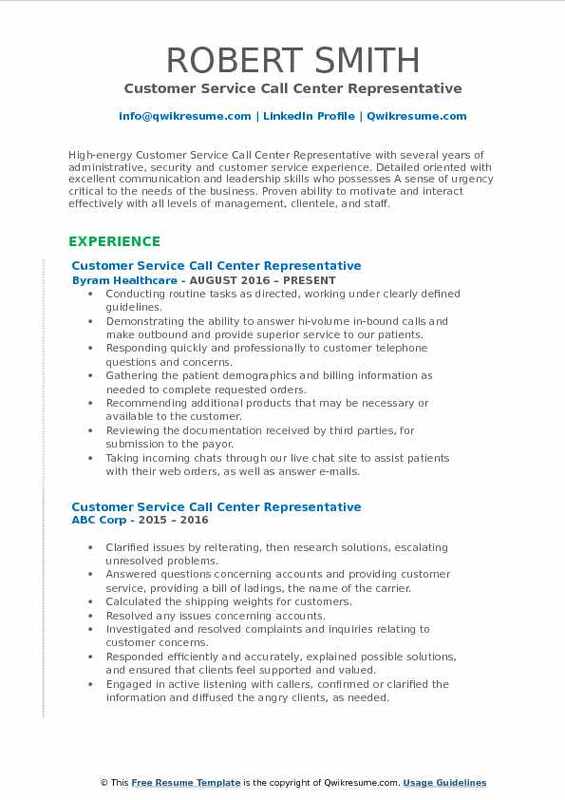 Headline : Qualified Customer Service Call Center Representative with 5 years of experience in the Healthcare domain offering a record of successful job performance, proven problem-solving ability and experience developing and implementing innovative solutions. Addressed the customer service inquiries in a timely and accurate fashion. Maintained up-to-date records at all times. 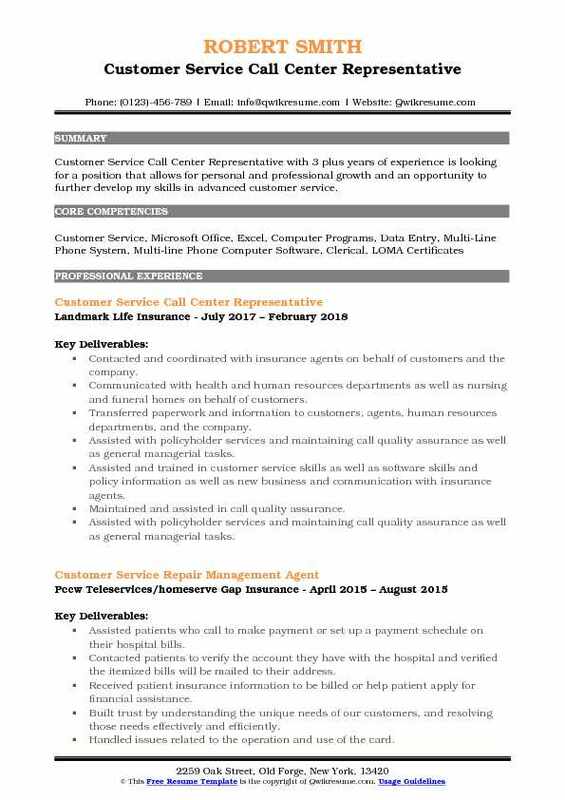 Summary : Senior Customer Service Call Center Representative with a diverse background of 9 years in retail, banking and cosmetology industries with a keen interest in Writing and Editing. Expert at catering to client needs regarding financial transactions, history, and guidance. Provides excellent customer service with attention to detail in a calm and respectful manner, proficient in computer navigation, credit card as well as sales transactions. Responded to an average of 70-100 telephone inquiries per day from clients with diverse backgrounds inquiring on complex financial issues in regards to balance, transaction and statement history. Performed transactional research and negotiated fee reversals when appropriate. Placed debit card orders for lost, stolen or expired cards, processed work orders for statements, check images, 1099s forms, and transaction requests: processes application for credit cards and other loan services. Placed account lockouts and other security functions for bank customers. Handled all client issues in a discreet, professional manner, delegated responsibly when necessary by transferring calls to another department or referring to outside agencies. Completed 48 class sections in compliance college and CSR training including mortgage fraud awareness, consumer credit reporting, commercial compliance and cultural diversity training. Took customer escalations from CSRs, resolved customer issues and corresponded to customer complaints. 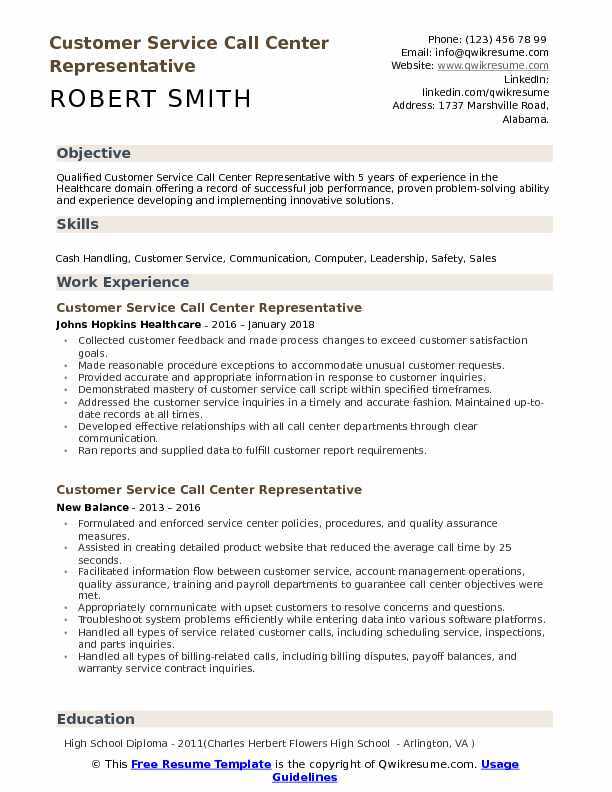 Headline : Senior Customer Service/Call Center Representative with 8+ Years of experience in a call center environment, seeking a secure position with a stable and profitable organization, where I can be a member of a team and utilize my customer service expertise to the fullest. Delivering customer value by fielding 100+ customer inbound and outbound calls per day across 4 markets in Texas and 1 in Georgia including Tara Energy, Amigo Energy, Smart Prepaid Electric, Just Energy and Commerce Energy. Researching and resolving an average of 1000 inquiries in any given week and consistently meet performance benchmarks in all areas (speed, duration of calls, limited supervisory escalation, availability, accuracy and volume). Handling customer complaints, discrepancies, requests and inquiries. Inquiries include: billing, new account set up, home service requests, troubleshooting, pricing tiers, technical IT support, credit card payments and adjustments to customer accounts. Managing the customer conflicts and challenging situations and as needed reporting/escalating issues through the appropriate channels. Primary mentor/trainer and lead "go-to" person for new reps and particularly challenging calls for both new and established employees. Consulting with the customers to recommend and sell a variety of just energy products and services to meet the customers needs. Multitasking through multiple computer software programs while interacting with customers. 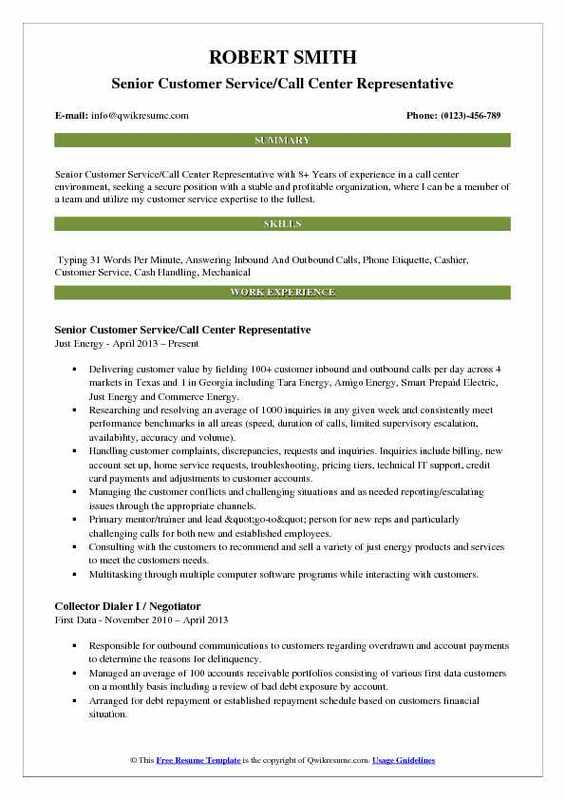 Objective : High-energy Customer Service Call Center Representative with several years of administrative, security and customer service experience. Detailed oriented with excellent communication and leadership skills who possesses A sense of urgency critical to the needs of the business. Proven ability to motivate and interact effectively with all levels of management, clientele, and staff. Conducting routine tasks as directed, working under clearly defined guidelines. Demonstrating the ability to answer hi-volume in-bound calls and make outbound and provide superior service to our patients. Responding quickly and professionally to customer telephone questions and concerns. Gathering the patient demographics and billing information as needed to complete requested orders. Recommending additional products that may be necessary or available to the customer. Reviewing the documentation received by third parties, for submission to the payor. Taking incoming chats through our live chat site to assist patients with their web orders, as well as answer e-mails. Assessing and transferring any reportable communications to the appropriate departments. Objective : Jr. 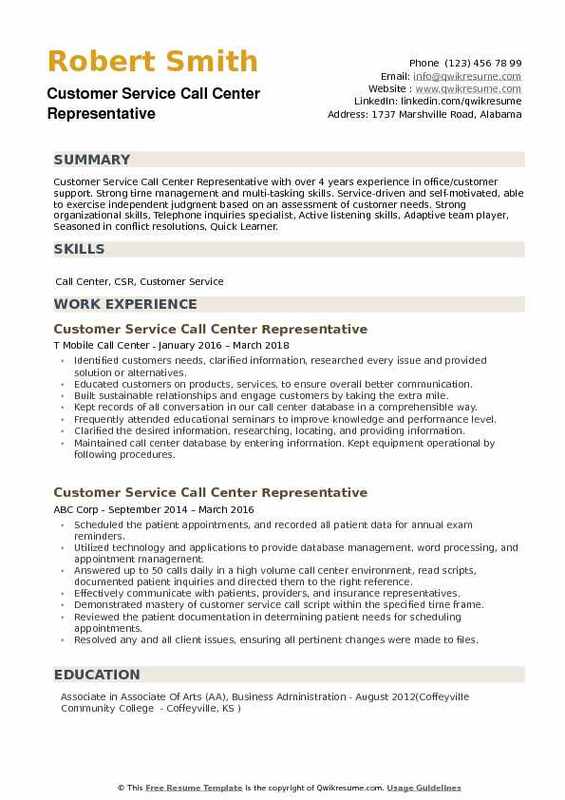 Customer Service Call Center Representative with 4 years of experience, advanced knowledge of Medical Terminology and Anatomy. Follows directions well and works well with minimal supervision, ability to communicate information and ideas so others can understand. Speaks well to others to convey information effectively and with confidence and the ability to multi-task and problem solve with accuracy. Answering questions and resolving the issues as a “single-point-of-contact” based on phone calls, plan sponsors, PSS/ISO, members, and providers. Providing customized interaction based on customer preference and individualized needs. Educating and assisting the customers with various elements of benefit plan information and available services created to enhance the overall customer service experience with the company. Utilizing all relevant information to effectively influence member engagement. Proactively assessing the customer issues and anticipating their needs. Determining if the member call should be extended based on the issues and customer needs. Taking an immediate action when confronted with a problem or made aware of a situation. Taking the ownership of each customer contact to resolve their issues and connect them with additional services as appropriate. 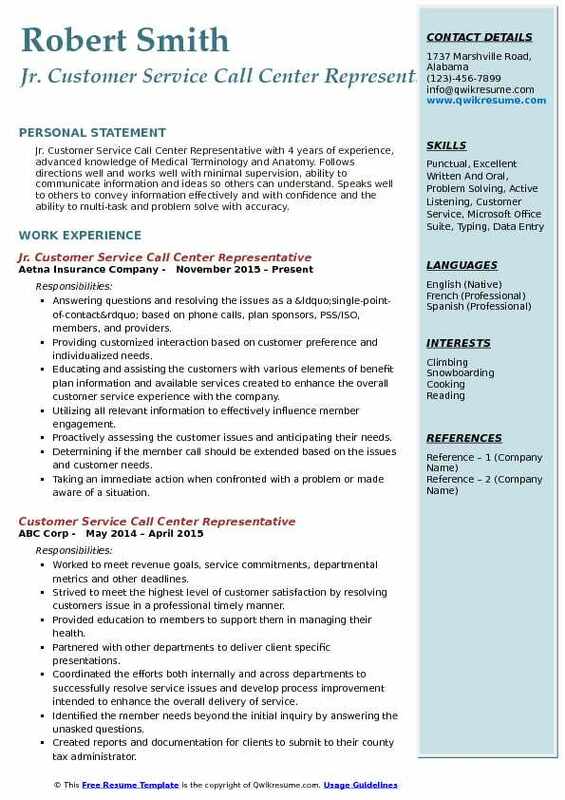 Objective : Customer Service Call Center Representative with 2 plus years of experience seeking a challenging position with an opportunity to learn, gain work experience, and utilize skills in the best possible way for enhancing the corporate expectations and goals. My objective is to obtain a position in a professional office environment, where there is a need for a variety of office management tasks including - computer knowledge, organizational abilities, business intelligence and database program use. Referred any unresolved customer grievances to designated departments for further investigation. Followed compliance with company regulations by maintaining the confidentiality of clients information. Documented details of customer interactions such as inquiries, complaints, or actions taken, in an organized manner. Developed comprehensive knowledge of insurance and claim regulations, processes and guidelines. Determined charges for services requested, collected payments, and arranged for billing. Became the lead "go-to" person for new agents and challenging calls, as one of the companys primary mentors/trainers of both new and established employees. Assisted the company with attaining the highest customer service ratings, earned 100% marks in all grading categories including communication skills, listening skills, problem resolution and politeness. Summary : A talented and customer oriented Sr. 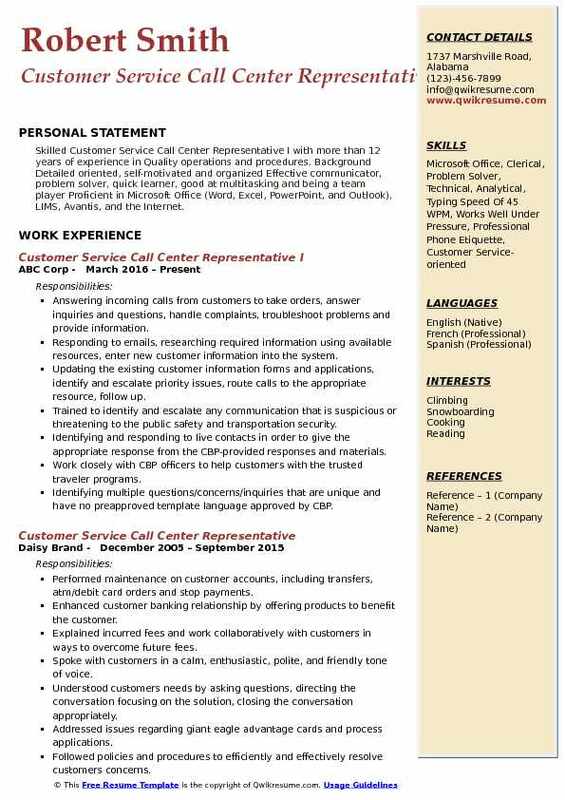 Customer Service Call Center Representative with 7 years of experience looking to further my career by expanding my horizons into administrative and office services fields. Obtaining the client information by answering telephone calls, interviewing clients, verifying information. Determining the eligibility by comparing client information to requirements. Informing the clients by explaining procedures, answering questions, providing information. Maintaining and improving the quality results by adhering to standards and guidelines, recommending improved procedures. Updating the job knowledge by studying new product descriptions and participating in educational opportunities. Accomplishing the sales and organization mission by completing related results as needed. Landed new customer accounts through a consistent combination of perseverance. 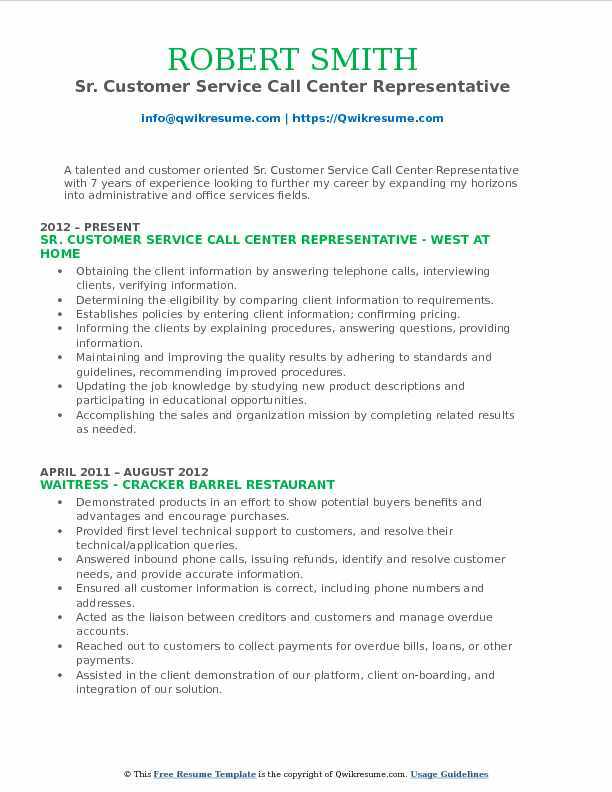 Objective : Customer Service Call Center Representative with 3 plus years of experience is looking for a position that allows for personal and professional growth and an opportunity to further develop my skills in advanced customer service. Contacted and coordinated with insurance agents on behalf of customers and the company. Communicated with health and human resources departments as well as nursing and funeral homes on behalf of customers. Transferred paperwork and information to customers, agents, human resources departments, and the company. Assisted with policyholder services and maintaining call quality assurance as well as general managerial tasks. Assisted and trained in customer service skills as well as software skills and policy information as well as new business and communication with insurance agents. Maintained and assisted in call quality assurance. Provided splendid customer services to customers in a friendly and courteous manner. Addressed customer service inquiries in a timely and professional manner. Summary : Skilled Customer Service Call Center Representative I with more than 12 years of experience in Quality operations and procedures. Background Detailed oriented, self-motivated and organized Effective communicator, problem solver, quick learner, good at multitasking and being a team player Proficient in Microsoft Office (Word, Excel, PowerPoint, and Outlook), LIMS, Avantis, and the Internet. Answering incoming calls from customers to take orders, answer inquiries and questions, handle complaints, troubleshoot problems and provide information. Responding to emails, researching required information using available resources, enter new customer information into the system. Updating the existing customer information forms and applications, identify and escalate priority issues, route calls to the appropriate resource, follow up. Trained to identify and escalate any communication that is suspicious or threatening to the public safety and transportation security. Identifying and responding to live contacts in order to give the appropriate response from the CBP-provided responses and materials. Work closely with CBP officers to help customers with the trusted traveler programs. Identifying multiple questions/concerns/inquiries that are unique and have no preapproved template language approved by CBP. 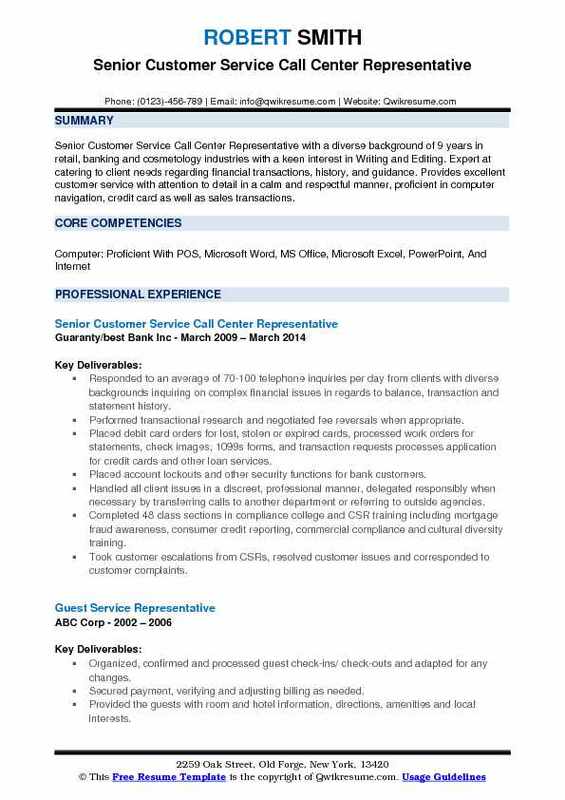 Objective : Customer Service Call Center Representative with over 4 years experience in office/customer support. Strong time management and multi-tasking skills. Service-driven and self-motivated, able to exercise independent judgment based on an assessment of customer needs. Strong organizational skills, Telephone inquiries specialist, Active listening skills, Adaptive team player, Seasoned in conflict resolutions, Quick Learner. Identified customers needs, clarified information, researched every issue and provided solution or alternatives. Educated customers on products, services, to ensure overall better communication. Built sustainable relationships and engage customers by taking the extra mile. Kept records of all conversation in our call center database in a comprehensible way. Frequently attended educational seminars to improve knowledge and performance level. Clarified the desired information, researching, locating, and providing information. Maintained call center database by entering information. Kept equipment operational by following procedures. Reported malfunctions, updated job knowledge by participating in educational opportunities. Maintained exceptional relationships with clients via telephone contact, addressing inquiries, and maintaining organization in incoming call tracking, and disbursement.